In order to cater diverse requirements of the clients, we offer an exceptional range of Trousers. Waist Size: 26", 28", 30"
Taking quality as our principal concern, we are betrothed in presenting an excellent quality of Ladies White Trousers to the prestigious customers. Cotton Stretch Pants in Woven Fabric (with concealed side zipper and a pocket). Side Slit at the bottom. Avaible in L, XL, XXL, XXXL sizes. 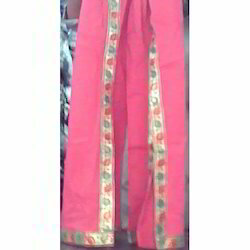 We are the foremost organization in the industry, engaged in offering the best quality Ladies pants. With very extensive years of knowledge and sincerity, we are best in designing preeminent looking Ladies Office Trousers at affordable rates.